Our Birth Announcement Won’t Fit in an Envelope. A 6-foot stork yard sign on the front lawn lets friends and neighbors know the baby has arrived. The birth or adoption of a baby is one of the most exciting times in a couple’s life. And it’s an excitement they want to share with others. Help your friends or family members announce their new bundle of joy by renting one of our beautiful baby signs for their front lawn. You can choose from a 6-foot stork or a 4-foot moon, sailboat, or baby carriage. No matter which of our baby signs you choose, it will look great in their yard and will include a personalized keepsake the parents will treasure forever. PLEASE CHOOSE FROM OUR SELECTION OF BABY SIGNS. Don’t forget the siblings and grandparents! The baby’s siblings will love seeing their name on a coordinating yard sign. Our sibling signs announce that they’re now a proud big brother or big sister. And we’re not just a stork rental service for parents. A lot of grandparents rent our stork signs to let their friends and neighbors know their grandchild has arrived. When the grandparents’ sign is rented at the same time as the parents’ sign it’s discounted. A discount also applies to rentals for multiple births. The first sign is regular price and each additional sign is 50% off. Stork Lady Signs has been helping families announce their new arrivals since 2002. We’d love to help announce the arrival of your special baby. Birthdays come but once a year! Make them extra special for your family and friends by surprising the honoree with a birthday lawn sign. Whether you’re celebrating a child’s first birthday or your grandmother’s 100th, we have a festive cupcake sign to celebrate it! Our cupcake signs are customizable to match most party themes or the personality of the recipient using interchangeable toppers. Please CHOOSE FROM OUR SELECTION OF BIRTHDAY SIGNS. The Stork Lady moonlights as The Birthday Lady. If you need a sign to help celebrate a birthday, The Birthday Lady has an assortment to choose from for any age. Visit us at BirthdayLadySigns.com. Looking for a fun and affordable way to earn extra money? Stork Lady Partners have been earning money while having fun for 20 years. Visit us at StorkLady.com for more information. 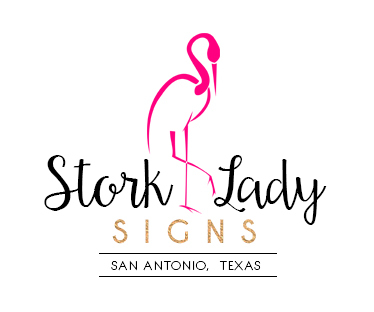 Stork Lady Signs is the premier stork yard sign rental service in the greater San Antonio, Texas area, including Boerne, TX. We have 14-years experience in lawn display rentals, stork sign rentals, newborn sign rentals, baby sign rentals, and baby announcement stork signs. We also deliver birthday lawn signs, cupcake, mermaid, butterfly, princess, ballerina, football player, train, fireman, airplane, cowboy and pirate ship birthday yard signs, first birthday lawn signs, 13th birthday, Quinceañera, Sweet 16 Lawn displays, 18th Birthday, 21st Birthday, 40th Birthday, 50th Birthday, Over the Hill, Mother’s Day lawn signs, Christening and Anniversary yard signs.